Kay Adams: Michael, you never told me you knew Johnny Fontane! Michael: Sure, you want to meet him? Kay Adams: Well, yeah! Sure. Michael: My father helped him with his career. Kay Adams: How did he do that? Michael: Let's listen to the song. Kay Adams: [after listening to Johnny for a while] Tell me, Michael. Please. Michael: Well when Johnny was first starting out, he was signed to a personal services contract with this big-band leader. And as his career got better and better he wanted to get out of it. But the band leader wouldn't let him. Now, Johnny is my father's godson. So my father went to see this bandleader and offered him $10,000 to let Johnny go, but the bandleader said no. So the next day, my father went back, only this time with Luca Brasi. Within an hour, he had a signed release for a certified check of $1000. Kay Adams: How did he do that? Michael: My father made him an offer he couldn't refuse. Kay Adams: What was that? 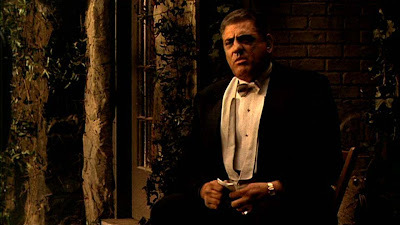 Michael: Luca Brasi held a gun to the bandleader's head, and my father assured him that either his signature or his brains would be on the release. Kay Adams: ... Michael: That's a true story. [cut to Johnny singing again for about 10 more seconds before going back to Michael] Michael: That's my family Kay, that's not me. Michael's war medals also emphasize that given the right circumstances he is prepared to kill. After his father is gunned down, and with Sonny's hotheaded and ill-advised retaliations threatening the family's survival, Michael is forced to confront that he may be the last best hope for the family, and tangentially, the Family. Michael's life takes a turn when he commits to the execution of Sollozo (Al Lettieri), the man responsible for his father's attempted murder. This event leads to Michael's exile to Sicily, where fate intervenes in so many ways that he never expected. He falls in love with, and marries a local, Apollonia (Simonetta Stefanelli), who eventually falls victim to the Mafia war his execution of Solozzo precipitated. His brother Sonny is also executed in the States while Michael is away. The man that returns from exile is devoid of any warmth, a coldly calculating pragmatist, eager to eliminate any and all who stand in his family's way. This conversation with his father illustrates the divergent paths each patriarch has taken. Vito's motivation has been protecting his family. The death of his eldest, Sonny, coupled with Michael's increasing involvement with the Family business, drive Vito to the realization that attaining power does not afford control over his family's safety. In fact, it lays the seed for the ultimate destruction of the Corleones. 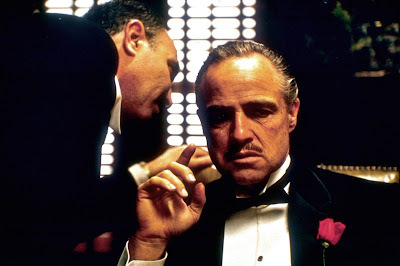 Don Corleone: So, Barzini will move against you first. He'll set up a meeting with someone that you absolutely trust guaranteeing your safety and at that meeting you'll be assassinated. I like to drink wine more than I used to. Anyway, I'm drinking more. Michael: It's good for you, Pop. Don Corleone: Ah, I don't know. Your wife and your children, are you happy with them? Michael: Very happy. Don Corleone: That's good. I hope you don't mind the way I keep going over this Barzini business. Michael: No, not at all. Don Corleone: It's an old habit. I spent my life trying not to be careless. Women and children can be careless but not men. How's your boy? Michael: He's good. 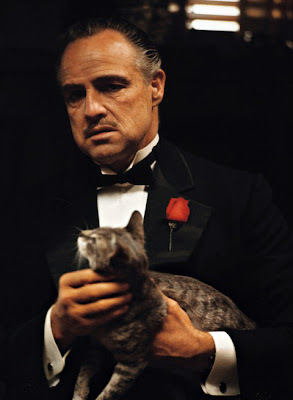 Don Corleone: You know, he looks more like you everyday. Michael: He's smarter than I am. Three years old and he can already read the funny papers. 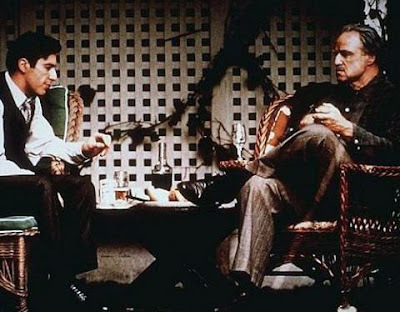 Don Corleone: [laughs] Read the funny papers... Oh, I want you to arrange to have a telephone man check all the calls going in and out of here because it could be anyone... Michael: I did that already, Pop. I took care of that. Don Corleone: Oh, that's right, I forgot. Michael: What's the matter? What's bothering you? I'll handle it. I told you I can handle it, I'll handle it. 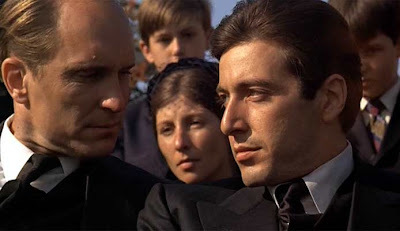 Don Corleone: I knew Santino was going to have to go through all this and Fredo... well, Fredo was... But I never wanted this for you. I live my life, I don't apologize to take care of my family. And I refused to be a fool dancing on the strings held by all of those big shots. That's my life I don't apologize for that. But I always thought that when it was your time that you would be the one to hold the strings. Senator Corleone. Governor Corleone. Something. Michael: I'm not a pezzonovante. 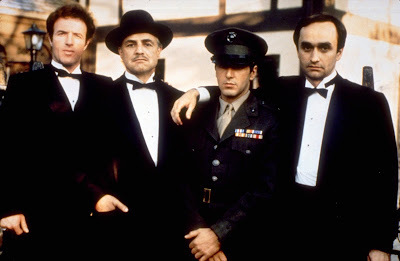 Don Corleone: Well, there wasn't enough time, Michael. There just wasn't enough time. Michael: We'll get there, Pop. We'll get there. Michael's mistake is in modeling himself after his father in order to achieve the results Vito couldn't. Believing in the false notion that he has lost enough to stay detached in the grand chess game he is playing, Michael does not foresee how history will repeat itself, and may even exact a higher price from him than it did from his father. The climax of The Godfather has Michael consolidating his power after Vito's death facilitates his ascendancy to the Corleone throne. In the last line of Michael's earlier exchange with Kay lies the crux of Michael's identity. It is the question that hangs over all three films. Many have made the assumption that it is answered by the end of Part II, but I would offer that the first two films simply show us the similarities and differences between father and son, Vito and Michael. Part II finishes the first patriarch's story, emphasizing the final price that Vito's life of crime exacts on his family, and more specifically, his son Michael. Michael's story is not concluded until we see the retribution destiny has in store for him in Part III. 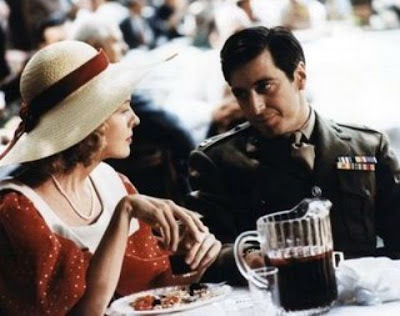 For more on the Godfather films, see: Seventies Cinema Revival: The Godfather Part II DVD Review: The Godfather Part III - Operatic Film Deserving of Reappraisal Stills courtesy of Paramount Pictures. I'd like to comment somehow, but it seems too hard to boil down thoughts on this film into a few sentences. I definitely need to write up these films on my blog one day. I look forward to your thoughts on Part III which is certainly flawed, but retains a certain power, especially in its conclusion which may be the most shattering moment of the whole trilogy - in part because it is so connected to what come before. That's one thing I love about these films - the way they become like lived experiences as they span years and characters. Ebert wrote about this once, the way we think of the characters in the movies as people we know. It's such a rich tapestry and a truly grand trilogy. Yeah, I love these films. That should read "truly grand tragedy" - though a grand trilogy it is, as well.